TEMPE – With Arizona State starting quarterback Taylor Kelly sidelined by a foot injury, backup Mike Bercovici isn’t flinching at the opportunity. 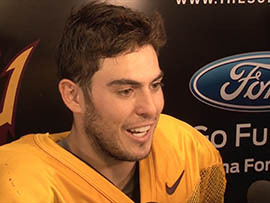 “I’ve been ready for this,” said Bercovici, a redshirt sophomore from Calabasas, California. Bercovici took over after Kelly’s third quarter injury and closed out the 38-24 win against the Colorado Buffaloes on Saturday. Facing a dozen reporters after practice Tuesday, Bercovici said offensive coordinator Mike Norvell has prepared him to lead. “It’s my job to get this team one point ahead when the clocks tick zero,” he said. Kelly, who was on crutches at practice, is out for ASU’s Sept. 25 home game against UCLA and probably longer. Bercovici said replacing Kelly is about more than having the chance to shine. Head coach Todd Graham said this team-driven mentality makes Bercovici special, calling him a more than just an adequate replacement. “Mike has a lot of things that he adds to the offense from a talent and skill standpoint. The key is we adapt what we’re doing to him,” Graham said. “This is a game that he has prepared for his whole life, and we’ll have a great plan for him,” he added. Norvell, the offensive coordinator, said one of Bercovici’s biggest strengths is his ability to constantly grow. Bercovici said his close relationship with Kelly makes the transition relatively simple. Bercovici said his readiness to lead is mostly the result of the coaches and a system designed to win regardless of who is holding the reins. Looking toward the UCLA game, that’s something he wants his opponents to know. Mike Bercovici says he's ready to serve as Arizona State's starting quarterback with Taylor Kelly out with a foot injury.